“History is not optional. It’s life giving,” author Isabel Wilkerson said during her Black History Month keynote speech at Merritt College on Feb. 1. 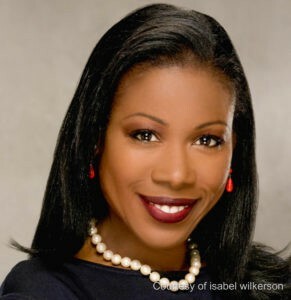 Isabel Wilkerson is the first Black woman to win a Pulitzer Prize. 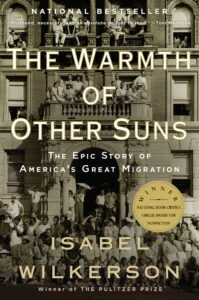 Her award-winning book, “The Warmth of Other Suns” (below), tells the story of the Great Migration. Wilkerson, a Pulitzer Prize-winning journalist and author of “The Warmth of Other Suns,” focused her keynote speech on the Great Migration and its importance today. Wilkerson became the first Black woman to win a Pulitzer Prize while she was Chicago bureau chief of the New York Times in 1994. At the time, it also made her the first African American to win for individual reporting. President Obama also awarded her a National Humanities medal in 2015 for her depiction of the Great Migration. At her keynote, students, faculty, and staff filled the Newton/Seale student lounge to capacity. Latecomers sat on the floor and lined the walls as Wilkerson began by saying she was moved to be standing on the same soil Huey Newton once stood and honored to be invited to speak on what would be the Black Panther Party co-founder’s 75th birthday. Wilkerson showed the audience her worn copy of her critically acclaimed book, “Warmth of Other Suns,” a New York Times bestseller and winner of numerous national literature awards. In the book she tells the story of six million African Americans who left the Jim Crow South to find new lives in northern and western parts of the United States. It has come to be called the Great Migration. She remarked in the book how this migration, which spanned over 55 years from 1910–1970, reshaped the urban United States as we see it today. Until Wilkerson’s book, the story had remained a relatively untold part of our nation’s history. One reason she set out to write the book, she said, was to illustrate the common humanity that binds us all together. It took her 15 years to write the book and collect information she would need to tell these untold stories. She eventually chose to illustrate this “leaderless revolution,” as she called it by telling the stories of three who made the migration: Ida Mae Gladney, George Swanson Starling, and Robert Joseph Pershing Foster. The book follows the three on their heroic journeys, and during her writing process Wilkerson even traveled many parts of their migration routes. “No other group of Americans had to act like immigrants in order to be recognized as citizens. That is the magnitude of what they had to do in order to be free in the country their ancestors had helped to build,” Wilkerson said of the people she documented. After the book was published, Wilkerson said she discovered it was not really about a migration, but more about freedom, and how far someone will go to achieve it. African Americans were no different than all other people who had stepped onto the soil of the United States, she said. In a recent radio show called “On Being with Krista Tippett,” Wilkerson spoke of the devastating division our country faces today, with so much talk about the “other,” and how “other” can mean many things. She asked: Where is the empathy and the “recognition of the common humanity of another person. “I feel as if the heart is the last frontier because we have tried so many other things,” she said. The event was introduced and organized by Ethnic Studies Department Chair Jason Seals. ‘Young, Gifted and Black” gave a moving and powerful performance as well. “Ms. Wilkerson’s lecture was moving,” said Seals. The story of six million African American migrants in search of freedom is a story of people, and one which remind us all of our common humanity.